A flying start for Peter Moores, Nottinghamshire's new head coach, who described the win as "special". (PHOTO BY: Mark Fear Photography). 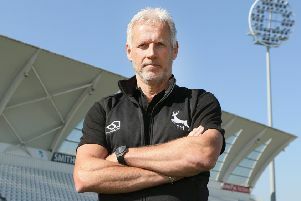 The perfect start to the new season by Nottinghamshire has been described by head coach Peter Moores as “special”. In his first match in charge, Notts swept aside Leicestershire by ten wickets in little over two days to get their Specsavers County Championship campaign off to a flier at Grace Road. It was just the launch-pad they needed after the shock of relegation from Division One last term, and Moores said: “Four-day wins are special because they are so hard to get. “It was a tough game, certainly over the first day and a half. But we got an opportunity to press on after Stuart Broad and James Pattinson’s eighth-wicket partnership of 122 in our first innings, and the nice thing was how we took it. Having been docked 16 points for recurring on-field indiscipline, Leicestershire are expected to be among the strugglers in the division. But they recovered well from 135-7 to finish with a total of 251 on the opening day and then reduced Moores’s troops to 167-7 in reply before Broad and Pattinson proved they can handle the bat as well as the ball, making half-centuries in that crucial stand. The duo lifted Notts to 329 and then helped to skittle the home side for just 81 before the visitors knocked off the handful of runs they needed to win. The match was most notable for an explosive debut by the club’s new Australian pace bowler Pattinson, whose knock of 89no was supplemented by eight wickets, including five in the second innings. There were also four wickets for England legend Broad and five for a seemingly revitalised Luke Fletcher.